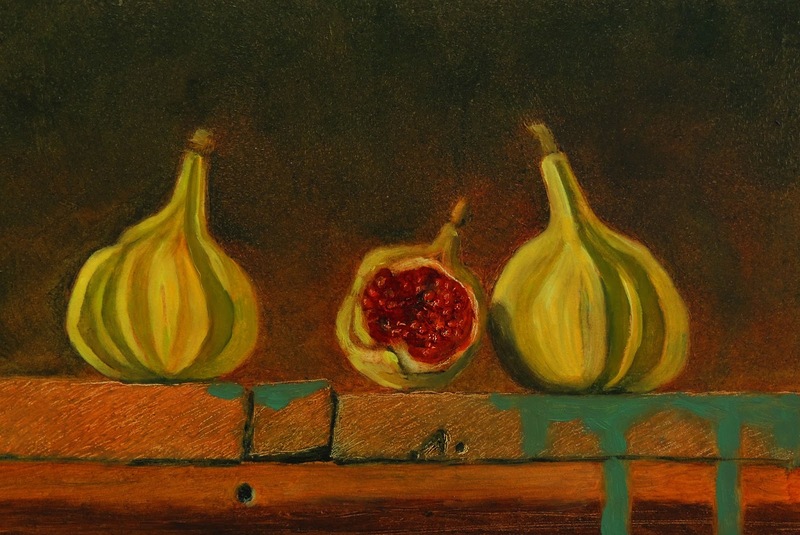 "Tiger Figs", oil, 5 x 7"
These lovely Tiger figs are placed atop a weathered wood box I found at a flea market many years ago. I particularly love this section of the top, the odd pieces, random marks and nail holes, the faded paint drips. The color of the paint is an old-fashioned, chalky aqua green. I mix it by graying a bit of permanent green light. I create the wood grain texture by scratching into the paint, wet or dry, with a palette knife. "Heirloom Tomato with Tiger Figs"
I'm sooo lucky to have many farmers markets brimming with fresh produce here in the city. From the Thursday Fairmount Market to Rittenhouse to Head House, there is no shortage of fresh vegetables, fruit and flowers. Here are three beauties atop an old box gleaned from the Golden Nugget flea market on Rt. 29 in New Jersey. Here is how the painting looks in lovely frame from The Frame Shop in Lambertville, NJ. This summer at the Philadelphia Free Library, I listened to physicist Frank Wilczek speak about his new book, A Beautiful Question: Finding Nature's Deep Design. 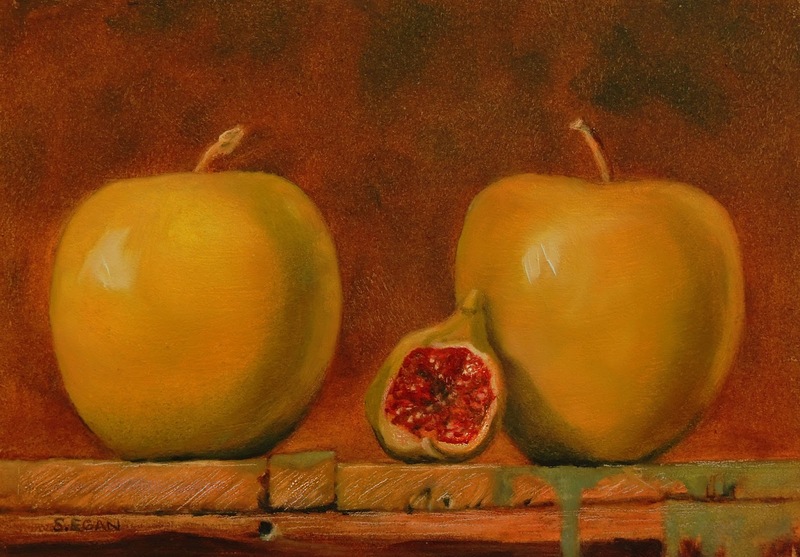 His talk inspired me to bookend this fig between two apples and paint them head on. 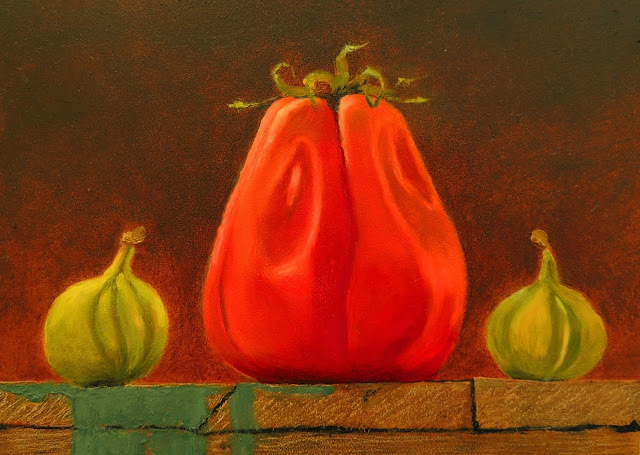 The result is a very suggestive little painting, as you can see. 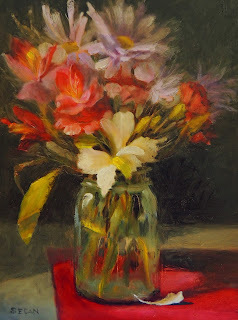 Market Bouquet, 6" x 8"
After living in Bucks County, PA, for nearly thirty years, this summer husband and I took the plunge, downsized and moved back to center city Philadelphia. We're a short walk from the Philadelphia Art Museum and the Barnes Foundation. No excuses for lack of inspiration now! I bought this little market bouquet in a shop called Plants, Etc. The mother-daughter proprietors have filled the place to the brim with all sorts of lovely greenery, especially succulents and miniatures. Lucky for me, the shop received a fresh delivery of flowers just before I arrived. I chose this bunch of purple coneflowers, red and white alstroemeria and carnations from the refreshing coolness of their overflowing flower fridge. The bouquet is the first subject I've painted in my new city studio space. Just the same as when I was back in Bucks County, I had to shoo the cat from my still life table to get started. Upon completion the cat resumed residence, covering my lovely red cloth with a weave of cat hair. The more things change, the more they stay the same!